First of all, in case you're wondering why it's been a while since I posted a review, it's because I've been reading the Song of Ice and Fire series, and it's incredibly long and time-consuming. I don't want to review all seven volumes separately, and I still have three left to read, so it's been slowing my progress with other novels. 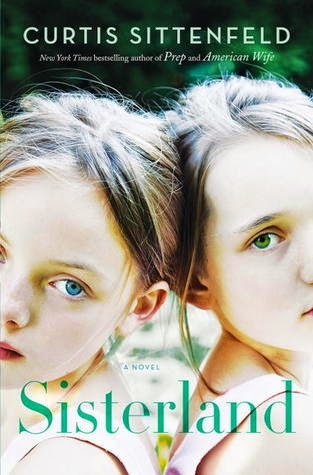 I'm now taking a break from George RR Martin, and have just finished Sisterland by Curtis Sittenfeld. A few years ago I read Sittenfeld's excruciatingly well-observed, frustrating coming-of-age novel Prep, about a girl who begs her parents to send her to a New England boarding school only to realise that she can never fit in - or admit that she has made a terrible mistake. Sisterland revisits some of these themes, and like Prep, it has a narrator painfully ill at ease with herself - so much so that she has even changed her name from Daisy to Kate to distance herself from her childhood and from Violet, her twin sister. Daisy and Violet are, to a degree, misfits purely by virtue of being twins, but to make matters worse they are also psychic, prone to 'senses' about people, places and future events. Whereas Violet is apparently happy to play the role of eccentric oddball, Daisy only reveals her talent when it seems it can help her make friends with the popular set - and needless to say, this backfires on her. As an adult, having reinvented herself as a housewife and mother to two pre-school children, Kate is every bit as embarrassed by Violet as she ever was - yet equally, also as inextricably linked to her despite their frequent rows. When Violet goes on public record as having predicted a major earthquake in the twins' home city of St Louis, Kate's past becomes not just an awkward shame but a threat to her family life, friendships and marriage. In Prep, Curtis Sittenfeld gave us a narrator who was frequently selfish, hard to like and frustratingly poor when it comes to decision-making, and to an extent this is also the case in Sisterland. There are times when Kate's feelings towards her chaotic, free-spirited sister seem painfully judgemental, particularly with regards to her weight and sexuality, and yet there are also times when Violet is such an infuriatingly selfish and disruptive influence that we can easily see why Kate would want to distance herself from her. It's also hard to sympathise with Kate when she jeopardises her marriage in the most of foolish of ways, but she at least partially redeems herself when she deals with the fallout from this in a steadfastly determined and courageous way. While the twins' psychic abilities are central to Sisterland's plot, this isn't really a book about ESP. It's a domestic drama of families, relationships, guilt and coming to terms with the past. The relationship between Kate and Violet is fascinating - are they really such very different people, or have they consciously chosen to push different aspects of their personalities to the fore? Also interesting - so much so that I'd have liked to have seen more of it - is Kate's relationship with her emotionally inept father, who despite being the sort of parent who buys his daughters low-value Starbucks gift cards for Christmas, is still responsible for some low-key, off-hand revelations that suggest there is more to him than meets the eye, if only his daughters had looked beyond the surface. This is more a novel of character than of plot; the latter, it has to be said, is not really the focal point of the book and is occasionally disappointing. Overall, though, the small-scale events of Sisterland set against the looming threat of a possible large-scale catastrophe make for a fascinating family drama.